Mike Perez talks to us about Prizefighter, Tyson Fury, Ireland and Cuba. 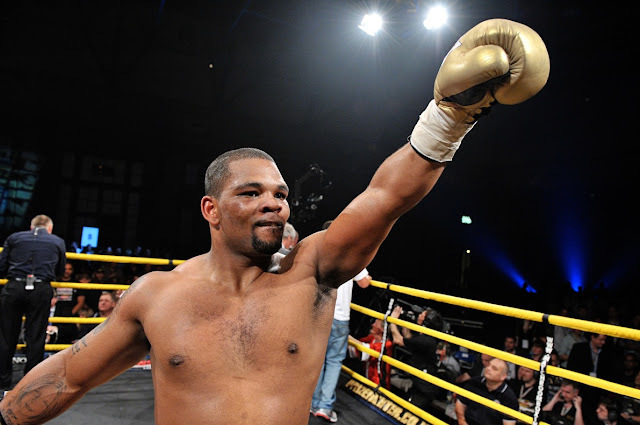 Mike Perez is a Cuban born boxer who is now based in Ireland. He turned pro back in January 2008 and his current record reads eighteen fights eighteen wins and zero losses with twelve of those wins coming by way of knockout. Ever since knocking out Tye Fields in the final of prize fighter, Mike is thought of by many boxing fans as one of the best prospects in heavyweight boxing. In his most recent fight Mike won a unanimous decision over Friday Ahunanya which was his first fight on American soil. Mike kindly agreed to talk to Punchbag blog. We started off by asking him why he decided to base himself in Ireland? Mike - I was not coming to Ireland, I was getting out of Cuba. I found a manager who brought me to Ireland, where I'm very happy to be. When did you come to the conclusion that you were good enough to turn professional as a boxer? Mike - Since I was a kid that was my dream-to go to America and become a boxing champion. When do you aim to be fighting again? Mike - Sometime in late March. Opponent TBA. In an ideal world, who would your opponents, be in 2012? Mike – Tyson Fury, Kevin Johnson or any top ten fighters. Hopefully by the end of 2012 I could get a world title fight. What is the situation with you and Tyson Fury? At one point it looked like you two were going to fight each other, how come this hasn't happened? Mike – I would love to fight Tyson Fury anytime, anyplace. My people were negotiating with his people and to my understanding, Tyson didn't want to fight me and his excuse was that I am not at his level. I really am not at his level, I'm above, and especially where heart is concerned-he's got no cojones! What do you know about British Heavyweight David Price? Mike - I know that Tyson gave up his belt, rather than fighting David. He looks like he's coming along good, and I wish him all the best. I hope if we ever had to fight, he wouldn't chicken out like Tyson Fury. Another British heavyweight Dereck Chisora is fighting for a world title this weekend, do you think he can win? Mike - Anything could happen in boxing, and I wish him all the best. You were the 2011 prize-fighter champion, winning a tournament like prize-fighter normally gives a boxer the opportunity to have big fights, why do you think that hasn't happened with you yet? Mike – My manager has been looking for the right deals/fights, so I guess my manager could answer that question better than me. I'm willing to fight anybody, anytime. Would you consider entering prize-fighter again? Mike – Yes. It would be an honour to defend my title. Hopefully there will be another international prize-fighter soon with bigger name boxers that I could go show I'm for real. You are 6ft tall, which now a days is small for a heavyweight, would you ever consider dropping down in weight to Cruiserweight if you can't get the fights you want at heavyweight? Mike – Mike Tyson was my size and the bigger guys feared him. I'm hoping to make the same impact by driving fear into the big guys. For all your loyal fans out there, what message do you have for them? Mike - In amateur boxing Cuban boxers are feared and respected by everyone. I want to continue the same as a professional boxer. I'll keep working hard and become the first IRISH /Cuban heavyweight champion of the world! Thanks to all my fans for supporting me, and I hope you guys continue to support me and look forward to bigger and better things in the future. Thanks again for talking to us Mike, we hope you have a big 2012. Mike - I sure will, Jake. Muchos gracias! It’s good to hear that Mike Perez is one of the very few heavyweight prospects who is willing to fight anyone out there and take on all challenges, we wish Mike Perez great success in the future, and remember to look out for Mike’s next fight in March, opponent TBA. Thank you Mike Perez and Colin Morgan.